DESCRIPTION: The late Andrew Hendrie wrote the book for first publication in 1988, having logged over seventy flights in Sunderlands during WWII and then begun a second tour in Wellingtons, the author began writing books about maritime flying operations in 1980. He died in 2004 and this new edition of his work provides a fitting tribute to his experience and work. The Catalina was the most versatile flying boat of WWII and was to continue on long after 1945 in a number of roles including SAR and fire fighting. Several Catalinas have been returned to flying standard as vintage warbirds. This says much for the design and its durability. Efforts have also been made to convert the Catalina to gas turboprop power and a number of viable airframes exist that could be brought back into operation. Had the PBY Catalina been only a flying boat, it would have been a less flexible weapons system and would probably have been scrapped after 1945. What made the aircraft so valuable was its amphibious version. This added a tricycle retractable undercarriage to permit operation from land bases. Its great endurance made it an ideal aircraft for operation across the Pacific were it could use existing airstrips and also operate into the multitude of islands that had no airfield. During its working life it served in many air forces and became an indispensable aircraft in British service. A Catalina, including an “unofficial” US observer relocated the German battleship Bismark, enabling carrier aircraft to disable the warship to allow the British fleet to catch and sink her off the French coast. The Catalina served in many roles, laying mines, attacking with torpedoes, serving in the anti submarine role, ferrying stores and personnel, providing Search And Rescue cover and acting as an air ambulance. In its ferry role, it was immortalized as “Big Belch” in the opening sequence of the film of the musical “South Pacific”. It excelled as a long range maritime reconnaissance machine. Able to stay aloft for more than 20 hours without refuelling, it could cover a large area. The Catalina flew in a curious nose down attitude that was a result of its small hull section with the wing mounted on a pylon and strut braced to the hull. To provide an adequate angle of attack during take off, the wing was fixed at a high angle relative to the hull line and once in the air, this made the hull nose down in level flight. The retractable wingtip floats did not deliver the hoped for drag reduction but made a cleaner looking form in flight. Large bubble canopies aft of the wing provided excellent observation ports. 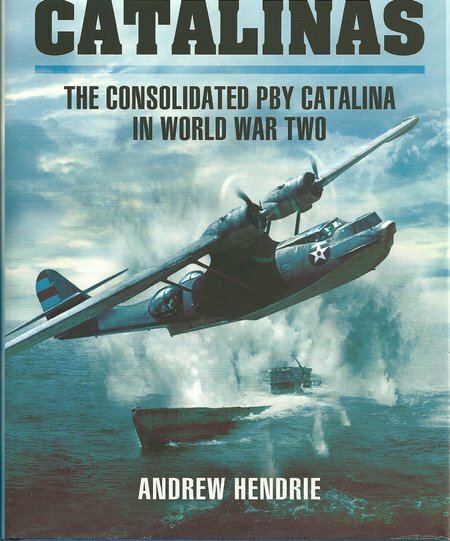 The author has told the Catalina story comprehensively and the text is very ably supported by some fine photographs embedded within the text. There are also drawings and maps, with appendices proving a wealth of further information. This is a very informative book that reads well and covers an exceptional aircraft that has previously received much less coverage than it deserved. It is sad that the author will never see the first rate job that the publishers have done in this new edition of his carefully researched work.